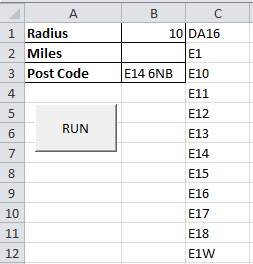 In short you input a post code and set a radius either in miles or KM and it gives you all the post codes within that area. As you can imagine this tool would be very useful! It would be good if say cell A1 had the post code and cell A2 had the distance in KM. This script would then look at this as the variable. I am not 100% sure put I think I then need to Parse the result to put them each into there own cell. Any help with this would be incredible! Not the answer you're looking for? Browse other questions tagged excel vba fetch . How can I retrieve JSON from an HTTP endpoint, from within Excel on MacOS, and parse it? How to make REST call to Content-Type=“application/json” via VBA in Excel? Nested Loop in VBA not working, because of different for loops? VBA Insert link in e-mail body without using HTML body?